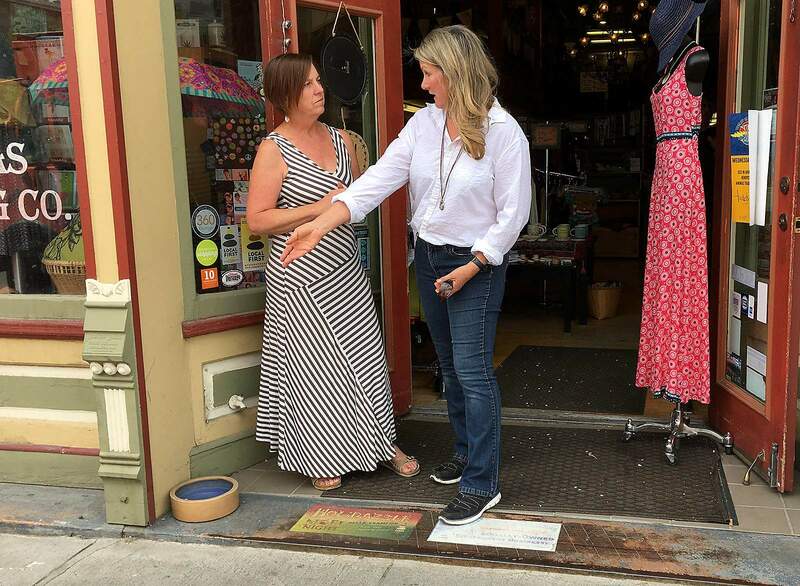 Kathy Sloan, right, talks with Cathy Wakeman, owner of Animas Trading Co., about a dog bowl placed in the entryway of her business. Sloan stepped on a dog bowl and broke her ankle in December 2014 outside Maria’s Bookshop. She’s now on a mission to warn other business owners of the potential danger, but is encountering resistance from Durango shopkeepers. Kathy Sloan stands outside Maria’s Bookshop, where she stepped on a dog bowl in December 2014, severely injuring her right ankle. The owners refused to remove the dog bowl until the case went to trial. 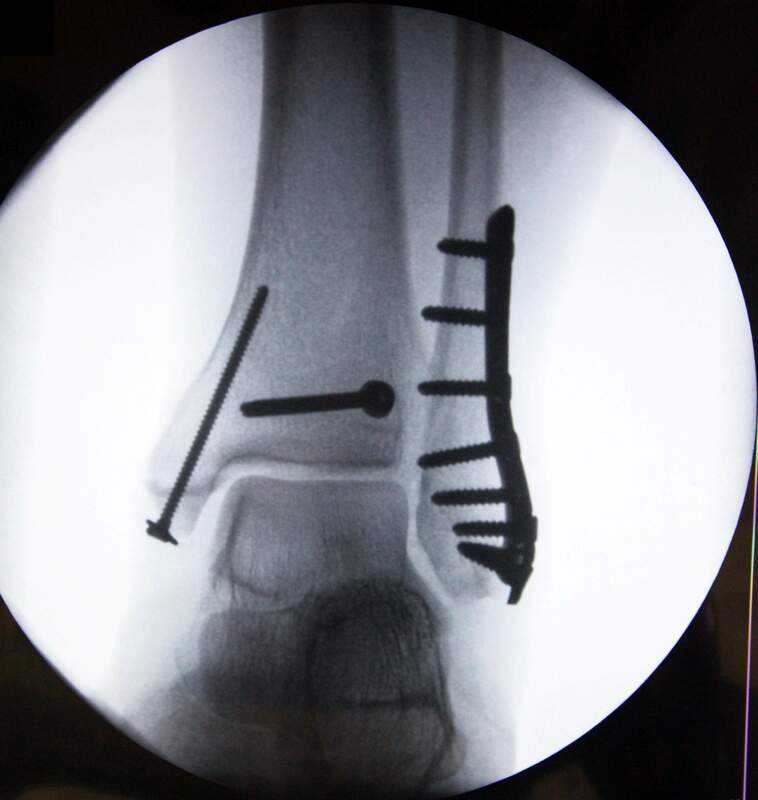 An X-ray of Kathy Sloan’s right ankle after having 10 screws and a metal plate installed. 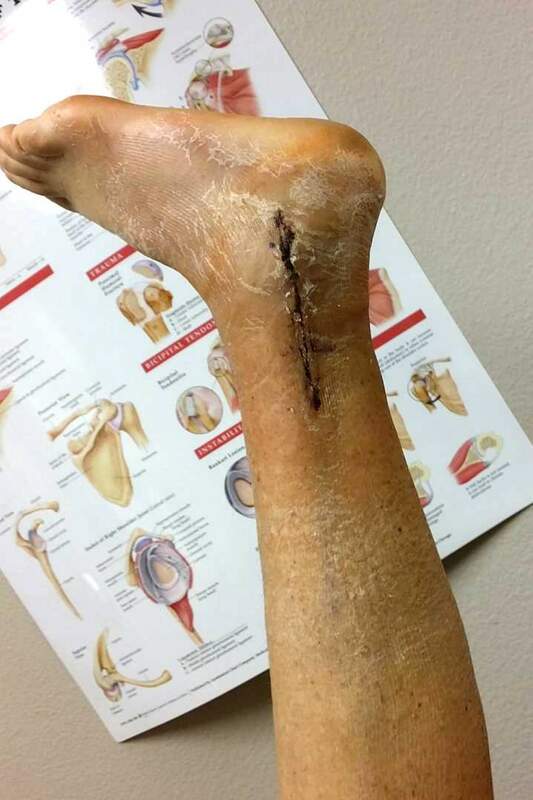 Kathy Sloan’s right ankle after surgery and removal of a cast. 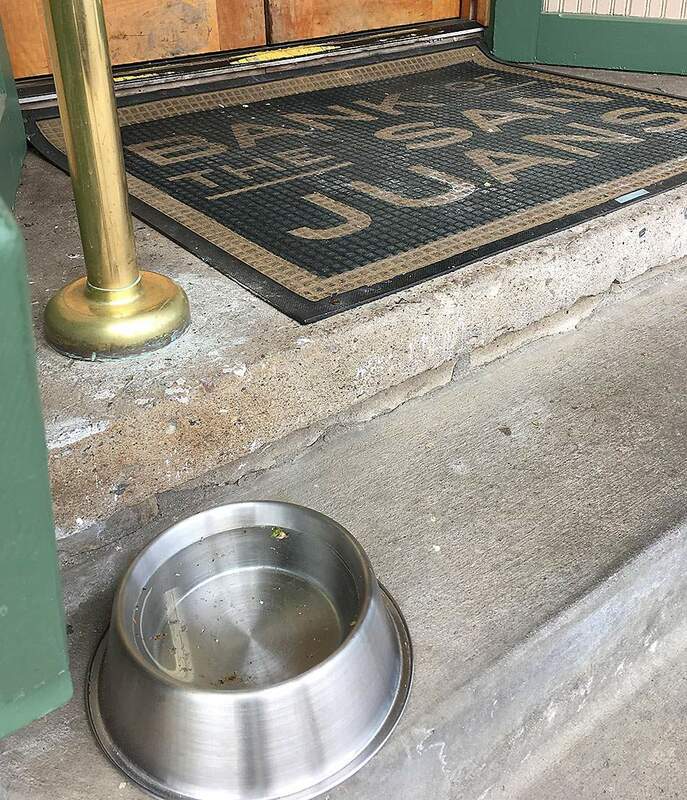 A dog bowl placed outside Bank of the San Juans, 144 E. Eighth St. in Durango. The bowl is on a step leading to the bank doors, and on the other side of a railing at the entrance. A watering bowl placed outside Durango Coffee Co. on Main Avenue in Durango. The bowl is in an alcove of the building, which is private property, so as not to violate city codes, which prohibit obstructions on sidewalks. A watering bowl placed outside Earthbound Trading Co. on Main Avenue in Durango. The bowl is in a recess of the building, which is private property, so as not to violate city codes, which prohibit obstructions on sidewalks. A watering bowl placed outside Durango Antique Market on Main Avenue in Durango. The bowl is in an alcove of the building, which is private property, so as not to violate city codes, which prohibit obstructions on sidewalks. A watering bowl placed outside Tippy Canoe on Main Avenue in Durango. The bowl is in an alcove of the building, which is private property, so as not to violate city codes, which prohibit obstructions on sidewalks. A watering bowl placed outside Schlotzsky’s on Main Avenue in Durango. The bowl is on private property so as not to violate city codes, which prohibit obstructions on sidewalks. 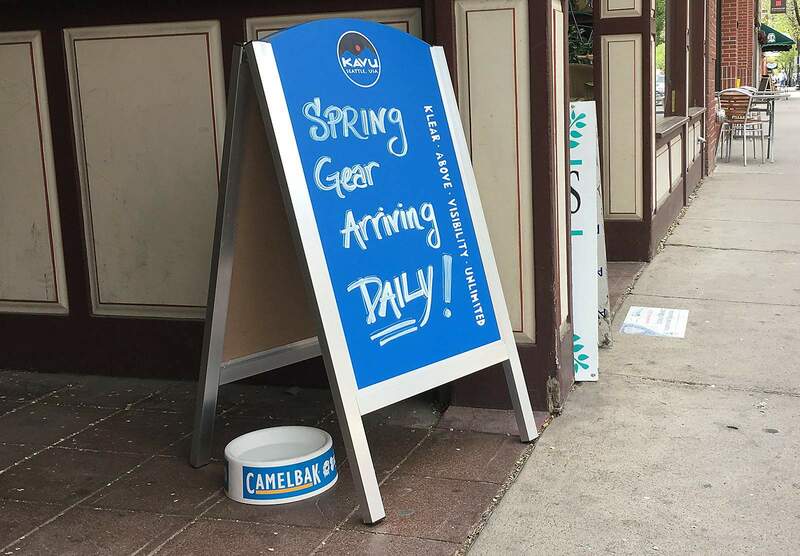 A Pagosa Springs woman who tripped and fell on a dog bowl while shopping in downtown Durango is trying to warn business owners of the potential danger. But so far, she has received a chilly reception. A Durango jury awarded Kathy Sloan $225,000 last month after a four-day trial in 6th Judicial District Court. The injury occurred Dec. 8, 2014, in front of Maria’s Bookshop at 960 Main Ave.
Sloan purchased a couple of greeting cards and was leaving the store when she sidestepped a woman carrying an infant, landing on a dog water bowl with her left foot and twisting her right ankle. The bowl sat under a water spigot against a wall at the front of the business. The misstep broke several bones in Sloan’s right ankle, which required a metal plate and 10 screws to repair. She still lacks feeling in her right foot. Maria’s Bookshop kept the dog bowl on the sidewalk until the trial – 812 days after the accident. Since learning of the successful lawsuit, other businesses have dug in their heels and kept their dog bowls. Some have posted signs above them saying it is in compliance with city codes. The incident highlights the issue of what’s allowed on sidewalks often crowded by tourists, and how far a dog-friendly town should go to accommodate furry friends in places people frequent. Peter Schertz, owner of the bookstore, said it was an unfortunate accident, but he’s had the dog bowl outside his business for about 17 years, and that is the only incident. No one had ever complained about it, and the city code enforcement department had not warned him about it, he said. “We did not feel that it was a hazard,” Schertz said. While the dog bowl has been removed, customers can come in and pick up dog treats, he said. “Things change; this is how they change, I guess,” Schertz said. “... The dogs are suffering, you could say, as a result. Durango prides itself as being a dog-friendly town. The Durango Area Tourism Office has an entire webpage devoted to dog-friendly activities around town. “Durango, Colorado, is a doggone friendly town!” it proclaims. 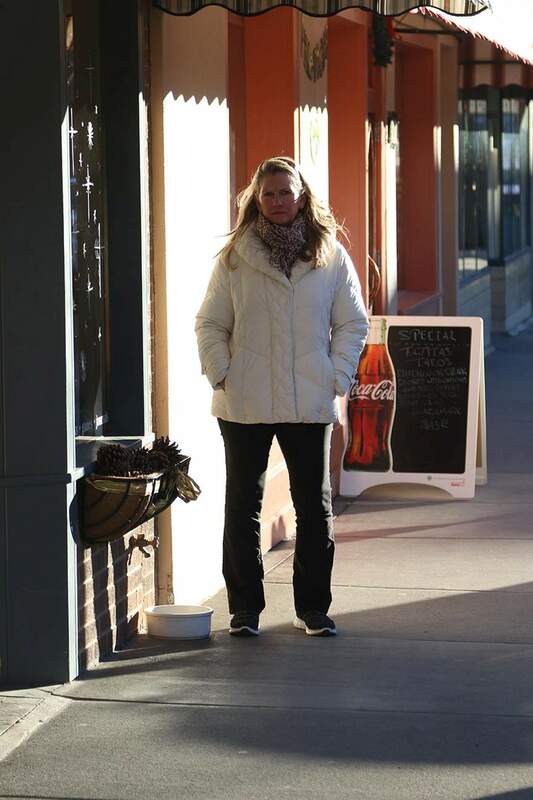 Sloan, 57, who has lived in Pagosa Springs for seven years, said she understands Durango’s love affair with its dogs, but she questions why businesses would place bowls along sidewalks and inside store entrances – where hundreds or thousands of pedestrians walk everyday – knowing it is a risk. As a result of her injury, Sloan wore a cast for eight weeks, was mostly bedridden for three months and missed her daughter’s graduation from Army boot camp. She is a former professional athlete who has run more than 20 marathons and competed in five Ironman competitions in Hawaii, Canada and Japan, according to statements she made under oath. She still has numbness in her right foot; she can walk but is unable to run. “I’ve been very athletic my entire life, and the enjoyment of those activities has now been taken away from me,” she said in a legal deposition. Sloan visits Durango periodically, and every time she does, she makes a point of talking to business owners who place dog bowls outside. When she introduces herself, she finds many business owners are familiar with her case and the lawsuit against Maria’s. As result, some have made up their minds to keep the dog bowl in place, she said. “Why would you jeopardize someone’s life and limb for that?” she said. Sidewalk obstaclesAccompanied by a Herald reporter, Sloan walked Main Avenue this week in search of businesses with dog bowls outside their doors. She found one outside Animas Trading Co., 1015 Main Ave., which is owned by Cathy and Doug Wakeman. Sloan asked to speak to the owner or manager and was immediately greeted by Cathy Wakeman. Together, they walked outside, where Sloan made a case for removing the dog bowl. Wakeman, who was familiar with Sloan’s injury, said the bowl has been placed outside her business for 10 to 15 years. Since learning of the lawsuit, she moved it off the sidewalk and into the recess of her entryway, where she says customers couldn’t possibly step on it. Sloan said customers could still step on it while coming or going, especially if they’re blind. She further warned Wakeman that lawsuit penalties increase dramatically once businesses or individuals become aware of a potential hazard and take no corrective action. The encounter escalated to a point that passers-by stopped to watch. Wakeman and Sloan eventually agreed to disagree. After the encounter, Wakeman said she tucked the dog bowl even further into the recess of her entry, but she has no plans to remove it. There are many obstacles on the sidewalk, including cracks and raised lips into doorways that can cause customers to trip and fall, Wakeman said. The dog bowl doesn’t present a hazard, she said. “Of the hundreds of thousands of people that have been through Durango over the years, and one person has tripped over a dog bowl – it’s an unfortunate accident that happened to her ... but stuff happens,” she said. 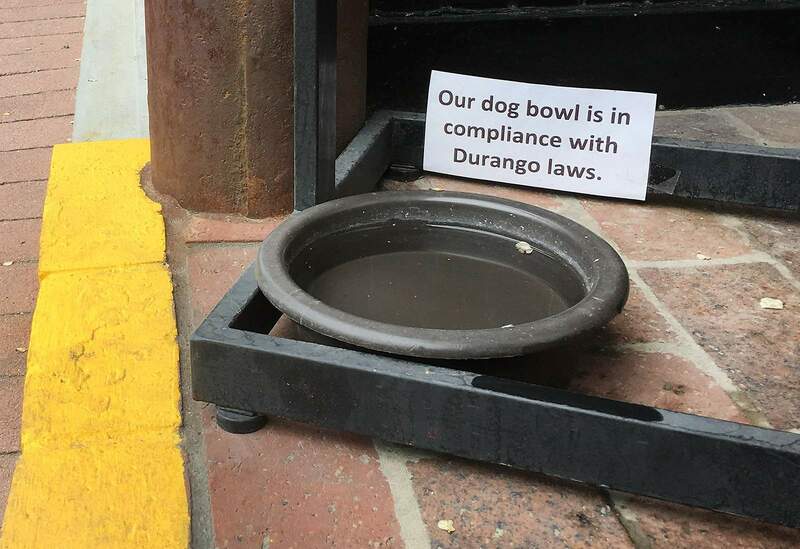 It would be a shame if one mishap changed a longstanding practice of offering dog water bowls in downtown Durango, Wakeman said. “It’s just part of our culture here in Durango that people have a dog, and we welcome dogs in the store,” she said. No one from the city or the Durango Business Improvement District has made contact with her about the bowl, she said. Steve Barkley, code enforcement officer for the city, said dog bowls are considered an obstruction and can’t be placed on sidewalks. But such codes are largely complaint-driven, and the city hadn’t received any complaints until Sloan made a formal grievance about a month ago, he said. Sandwich-board signs that advertise daily specials and other messages tend to be a greater issue, he said. 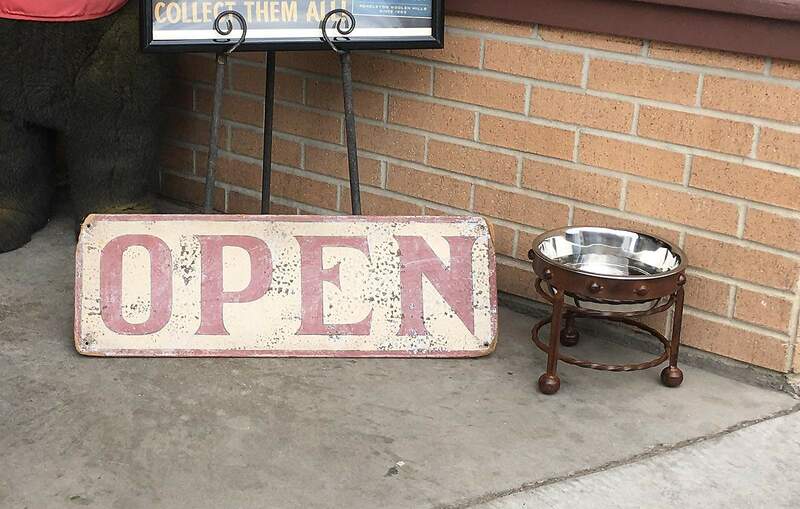 The Business Improvement District encourages shop owners to keep sidewalks clear, and if they want to put a watering bowl out for dogs, they should keep them in the entry recess or inside the store, said Tim Walsworth, executive director of the BID. BID frequently reminds members to keep sidewalks clear, but it hasn’t singled out dog bowls as a problem, Walsworth said. Panhandling is a far bigger concern, he said. Pet loversAmericans spend more than $60 billion on their pets each year, so businesses nationwide are increasingly becoming pet-friendly, said Jen Reeder, a local pet writer and member of the Dog Writers Association of America. Businesses shouldn’t be prohibited from offering dog bowls, Reeder said; unfortunately, the risk of being sued for $225,000 may deter some businesses from continuing the practice. “Durango is such a dog-friendly community, and it just would be such a shame to make our town less welcoming because of an unfortunate accident,” she said. Reeder said she appreciates being able to shop on Main Avenue with her dog, Rio, and knowing she can find water bowls on hot days. Water bowls also are a signal to the public that businesses are welcoming of dogs inside the store, she said. “It’s just something that makes it a little less fun to live here,” she said of dog bowls potentially going away. Sloan said her lawsuit is done and she has nothing to gain from educating businesses of the potential hazard. And it’s not like she became rich from the lawsuit; half of the $225,000 award will go to lawyers, and most of the remainder will pay for medical bills, she said. “I didn’t take them to court because I was looking for money,” she said. Sloan and her husband own two cats and no dogs – her husband is allergic to dogs – but Sloan said she loves dogs. She has volunteered with Dogster’s, a spay and neuter program in La Plata County, and the Humane Society of Pagosa Springs, she said. 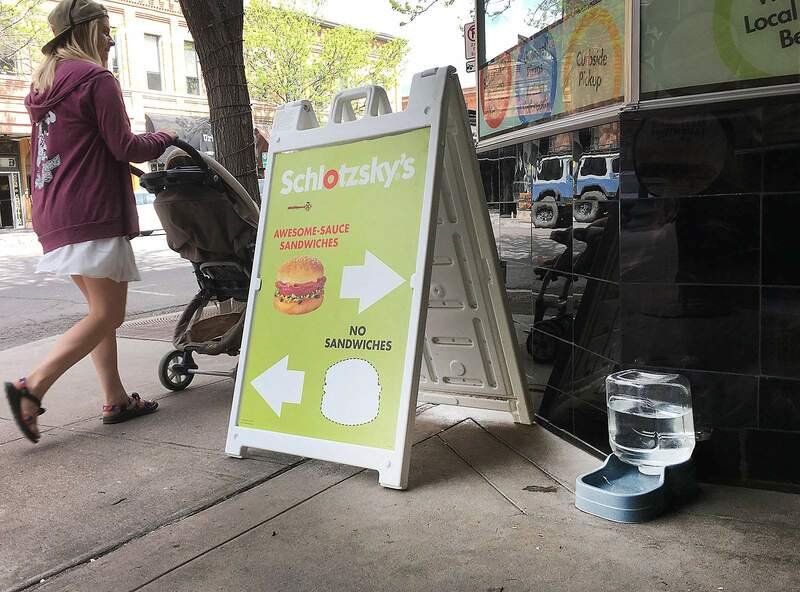 Sloan has received positive feedback from businesses in other towns where she warns them of the potential danger, she said, but Durango seems totally resistant to removing the bowls. That may be because local business owners are aware of her lawsuit against Maria’s and have made up their minds it was unfair, Sloan said. 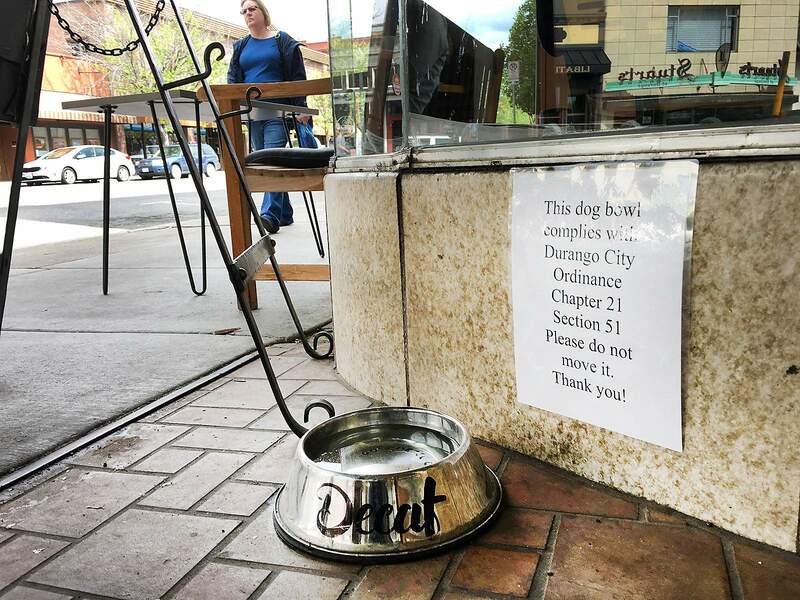 Should businesses in Durango remove sidewalk dog bowls for the safety of pedestrians?